Summary: 13 Reasons Why meets the poetry of Emily Dickinson in this gripping debut novel perfect for fans of Sara Zarr or Jennifer Brown. Review: When Reason Breaks is a fantastic and difficult book to read. Difficult in the sense that Cindy L. Rodriguez does an amazing job of showcasing two very different girls and their struggles with their families, friends, and school. There’s humor, yes, and happiness, and quiet moments of connection between these two different girls, but even the good times feel uncertain and fragile because of the opening: one of the girls—and we don’t know which one—attempts to commit suicide. In some respects, When Reason Breaks feels like a mystery as the reader attempts to figure out which of the girls left a suicide note and letters for Ms. Diaz. I personally felt that the answer was obvious, so that aspect of the book didn’t engage me as much as it probably was meant to. What Rodriguez does best, however, is giving the reader insight into both Emily and Elizabeth, especially how they deal—or don’t deal—with their emotions and the troubles they’re facing. Emily Dickenson’s poetry is integral to the story; not only does Ms. Diaz feature Dickenson’s work in her classroom, but most of the chapters begin with a line from one of Dickenson’s poems. The title of the book itself is a reference to “I felt a Funeral, in my Brain.” I felt most of the quotations were well chosen and that they were excellent ways to set the mood for each chapter, though a few felt shoehorned in. The rest of the characters—Ms. Diaz, Kevin, Tommy, family members, friends, and other members of the community—are an adequate supporting cast. Ms. Diaz was easily my favorite secondary character, though both Kevin and Tommy had good moments with Emily and Elizabeth. I do wish that Emily’s two friends hadn’t felt so interchangeable, though, and that they had a bigger part to play in Emily’s story than Kevin did. Recommendation: Get it soon, especially if you’re interested in a thoughtful exploration teen girls dealing with depression, dysfunctional families, and questions that don’t have easy answers. 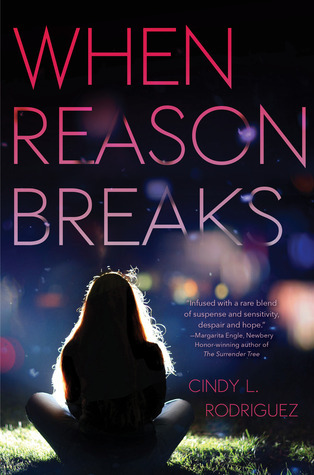 Between the Emily Dickenson’s poetry and Cindy L. Rodriguez’s prose, When Reason Breaks is a book that you’ll end up thinking about for a long time. Extras: Cindy L. Rodriguez’s guest post at Diversity in YA. “Depression in YA and the Latin@ Community” at Latin@s in Kidlit.